A place to discover the latest and greatest in power pop releases. At long last, we've found the missing link between Teenage Fanclub and The Replacements. This discovery comes in the form of Elvyn, an Ontario band that's released its third album over the course of a decade. The influences run deep here, and Big Star lies at the intersection of the two seminal bands referenced above, so there's that sound to consider as well. "Those Were the Days" kicks off the proceedings, and it's most definitely what the 'Mats would sound like if fronted by Norman Blake: great hooks 'n' harmonies, backed by a slightly ragged yet rocking rhythm section. "I Guess I Was Wrong" is a bit more laid back, with an easygoing countryish sound that betrays a bit of a Byrds/Burritos vibe, and "I'll Come Back" follows suit with another engaging melody. Elsewhere, "Lotta Lies" takes their sound into indie pop territory, as the double-tracked harmonies recall The Pernice Brothers; "Don't Leave, Don't Go" is a bright, upbeat pop number with a touch of melancholy, and "The Big Bay" has a Posies-like sweep. "Nature of Your Game" is straight-up Americana, in the manner of Joe Pernice's solo masterpiece "Bum Leg", and "I Was There" brings us full circle to Teenage Fanclub's more pensive moments. 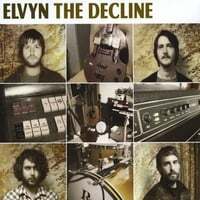 Wonderfully melodic, there's nothing in "decline" about Elvyn's sound and they've got a definite top 10 of '10 contender on their hands. A Kool way to start the week. Justin Kline could use your help.